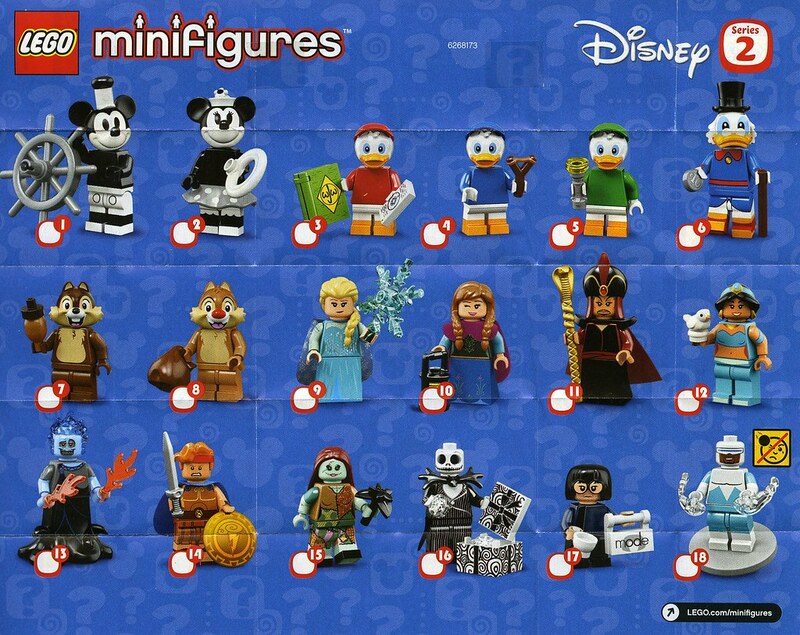 A box of 71024 Disney Collectable Minifigures Series 2 has arrived at Brickset HQ so we can now make a start on our review and report on the box distribution. Clearly that's very disappointing, particularly for those that buy complete boxes and resellers. The figures marked with a * are packaged in a bag-within-the-bag and are those with capes or other cloth components. The cloth piece is packaged outside the inner bag so take care when opening with scissors. Ah can’t wait for the review! It will help me decide how many duplicates to get! It’s disappointing that there are unequal numbers of figures per box. I liked it that they were arranged by row in the previous series! It made it so easy! "Brickset HQ".... would love to see a MOC of that place! Three of everyone besides four of Mickie, Minnie, Frozen peeps, and Chip and Dale. Boom! 60! Here's hoping Series 3 gives us Darkwing Duck!!! 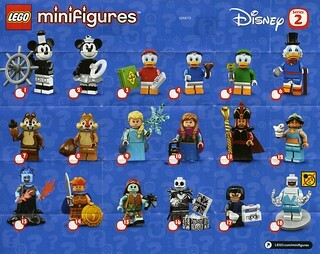 It's good that Lego put 4 Elsa and Anna minifigs in each box because they will be the most popular characters by far. There were only 3 Dorothys in TLM2 series and she was so popular that I had to visit 3 different stores to find one. Just go on eBay, I got 18 of the 20 TLM2 figures for $40, including all the Oz peeps. So they continue the new pack and booklet and bag inside a bag for the CMFs but does it continue the extra parts like TLM2 CMFs have. I only want one of each duck so I'm not bothered if they are 2 per box each and I like Mickey and Minnie and Anna and Elsa being amongst the most common. Pretty smart of LEGO. No way I would care about Huey, Dewie, and Louie unless they're chase 'figs. I still say that's 3 ducks too many in one series. Ah, all the ones I care about are common. That's good. Having 3 or even 4 of each duck would make for a lot of duck feeling. I’d imagine you did hear a lot of complaints. Well, at least there isn't only one per box figure! Is a pre-order possible at your Shop? Only having two of Huey, Dewie, and Louie in each box actually make's a lot sense to me. They're essentially recolors of each other anyway, so if any character *had* to be cut down it should be the less unique ones. Thanks for the update about the box distribution. Do you remember where Huey, Dewie, and Louie were placed? I mean in which row, front or back? OK, Scrooge was my single most wanted. Followed by Mickey and Minnie. Would like H/D/L but not paying a premium for them. Can't wait for the review!!! Getting the triplets will be "fun". I sort of understand, but still think it's lame. I love the Scrooge McDuck and Donald Duck Comics, especially the Carl Barks epic stories, but somehow the CFMs aren't doing it for me. I'll probably only get Hades for that hairpiece, Jack for the cool box, and Frozone because... Frozone! Still, looking forward to the review! My only fear is that scalpers will get wind of the artificial "rarity" of these, making it more difficult to complete a set since these will all be relatively easy to feel out. Hopefully I can can catch a fresh box sometime at the LEGO store and get a complete set. I know people are either not bothered or annoyed by the 3 ducks 1 per box distribution, but having got 7 classic police officer cmfs from series 18 they are quite easy to find. But then again I travel all over Worcestershire and surrounding areas so my experience is maybe different to others. My No.1 tip for finding these figures if you want some is to go to a shop that you know ha CMFs but wouldn't be everyone first choose to buy them, that's how I found 2 of my classic cops. (Waterstones and Waitrose). Fortuantely, Huey Dewie and Louie seem to be in the least demand from what I've seen, so this 'artificial rarity' shouldn't affect anything. I’m only interested in Jack and Sally so that’s fine by me! It's not accurate to say resellers will not like this because they just jack up the price for the 3 ducks. Yet another fail from Lego for a Minifigure series. How hard is it to make it 3 sets per box? The last series was great finally made it easier for everyone to get what they want and nothing rare so scalpy was somewhat subdued. Lego fans rejoiced. Now we're back to limited supply of select figures. Only scalpers win in this scenario. I remember a lot of people complaining about having all three of the nephews taking up space in the set. Now that we find out there are only six of them in the box, thus increasing the supply of non-nephew figures (including Scrooge McDuck!) people are complaining again? Gee, it's hard to please everyone...or anyone, sometimes! Personally, while I like the ducks and would enjoy having all three nephews, my life won't be blighted beyond repair if I only wind up with two, or even one. I'd rather army-build with Chip and Dale, myself; an army of nephews would be too chaotic for me to contemplate wanting! @sklamb an army of Chip and Dales would be great! Maybe I am the oddball out, I have decided to collect this set because of the 3 nephews hdl. When I first read the article and saw these were the rare ones, I was like "dammit" but after reading everyone's reaction, I now have hope, as these just might be the figures the masses reject, making them easy to find. Nice serie for me, I want them all, especially characters from 90s. yeyy 21317 set will be a disaster at selling, you can get the same minifigures with 8 euro. Really!!! No 3 sets in a box. That just seems wrong. Figures look nice and I am sure they will be popular. Pretty quick release after the TLM2 figures. As an FYI, full boxes are sold at TRU Canada, Mastermind, Walmart and even Costco in Canada. Lego.com and Lego stores do not sell them. Plus lots of sellers on eBay too. @hic1957, full boxes can be bought at certain places. So someone comes in and essentially just buys the full stock of any particular store. As for these, Lego does send out various sets to people for advanced review. This site and many others are actively engaged with Lego. Lego has an AFOL outreach program that interacts with various people for various things. This is why you often see set reviews posted the same day sets are actually announced. There's no conspiracy or hidden agenda. @hic1957 Lego won’t sell you a full box. Your best bet in the US is to find a Target or Walmart that happens to have an unopened box in their stockroom. Uncle Scrooge and the triplets were definitely on my Want List, as my daughter and I love watching the new Duck Tales. It has the nostalgia effect from watching it as a teen and the writing on the new show is funny and action packed. Bummer then about the triplets being harder to find as a group though. Funny how people are mentioning that Dorothy was somewhat of a rarity, as I've had a difficult time tracking her down.